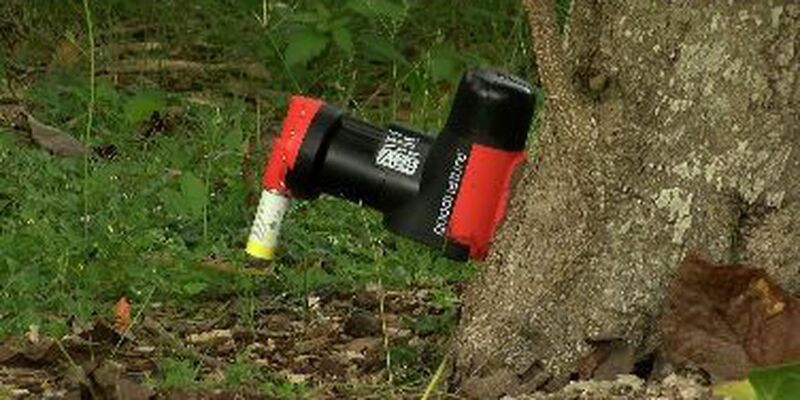 WAHIAWA, OAHU (HawaiiNewsNow) - Over the next few months workers from Schofield Barracks will place about 1,000 rat traps in the Waianae and Koolau mountains. They're modern models of traps that re-set themselves. The Goodnature A24 trap holds bait that can last for months. The scent lures rats into a chamber. The rodent triggers a piston that strikes and instantly kills it. Army biologist Paul Smith said the rats threaten endangered species including the Elepaio, the tree snail, and many native plants. "On Army lands both here and on the Big Island we manage over a hundred threatened and endangered species," he said. "These traps can kill up to 24 rats before we have to reset them," said Tyler Bogardus, Schofield's Small Vertebrate Pest Stabilization Specialist. The new traps replace single-kill traps. The Army's putting them in hard-to-get at spots. first on state and private land then on training grounds on Oahu and the Big Island. "The spots that we're working in are really rugged and mountainous terrain. The way we do it is we put them on trails that are in networks of grids of traps," Bogardus said. The traps were invented in New Zealand. Blair Calder of Automatic Trap Company said they're now being used all over the United States. "With enough of these in network across an area you can exterminate an entire population and keep the population at bay," he said. On Lanai, the traps help control rats that threaten the Hawaiian petrel. Because of the remoteness of where the Army's placing the traps, Smith said Schofield isn't aiming for rat eradication but for efficient control. "By doing that we ensure that we have traps in all the rat territories so that we can keep the rats from re-invading the area.," Bogardus said. "We don't have to send people out into the field as often," Smith said. "We're seeing savings as far as our overall budget with this new method.". Calder said the traps don't use rat poison so a dead rodent's carcass is safe for predators to eat. The Army will eventually have 1,500 of the Goodnature A24 traps locked and loaded and in the field.